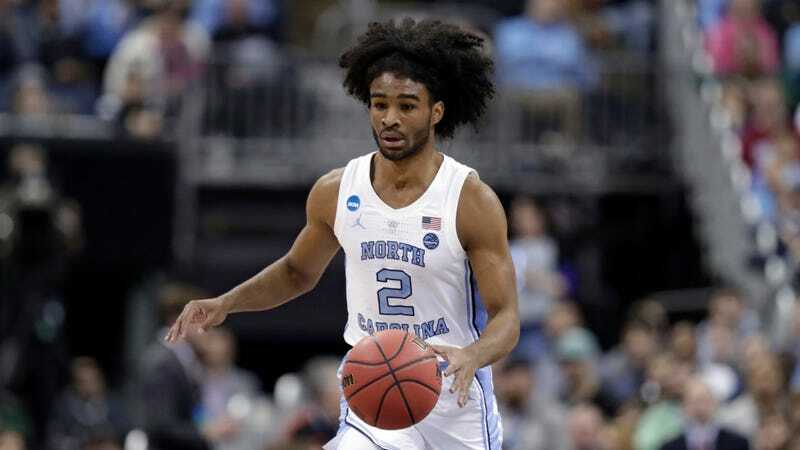 There may be no better match of team style and player than 2019's North Carolina squad and freshman point guard Coby White. The normally pretty fast Tar Heels made the jump into warp speed this season, averaging more possessions per game than any other tournament team, and both superficially and practically, White is a perfect fit for that kind of high-speed, high-scoring play. “We’ve never played as fast as I want us to play,” Roy Williams said of all that time before White showed up in Chapel Hill. UNC beat Washington 81-59, as everyone expected this afternoon, and White came out of the gate red hot. He hit four of his first five shots—all threes—and finished with 17 points to go with six boards. This step-back trey, in particular, could bring a smile to anybody’s face. 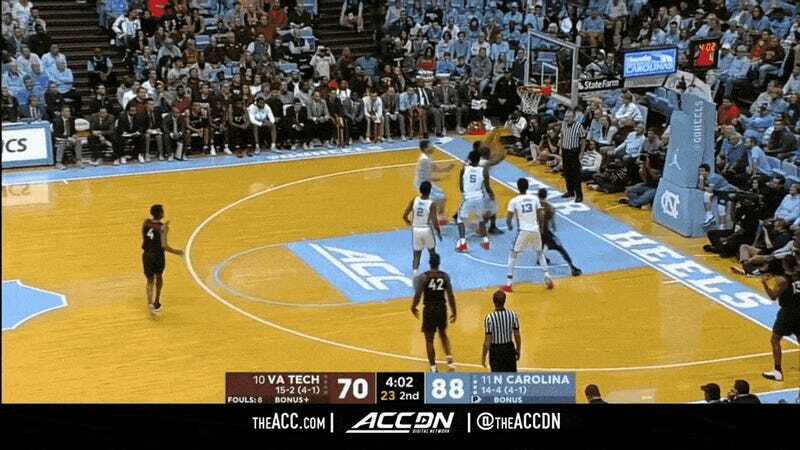 But the most quintessential Coby White play of the afternoon came about five seconds after a made Washington basket in the second half. Before the Huskies could set their defense, White took the inbounds and took off, using his quickness and a behind-the-back dribble at the three-point arc to slice through his opponents and score at the rim. The Flash himself couldn’t have done it better. That alone is absurd, but White’s more than just a cheetah on the wide-open plains. As the season’s gone on, he’s become incredibly adept at changing speeds to slip through defenses, which makes him even trickier to stifle. Watch how he accelerates after crossing halfcourt to torch some Cardinals, with just one efficient crossover doing the job. Speed becomes a lot more valuable when it’s paired with intelligence and body control, and boy does White know how to use all three of those things to score. 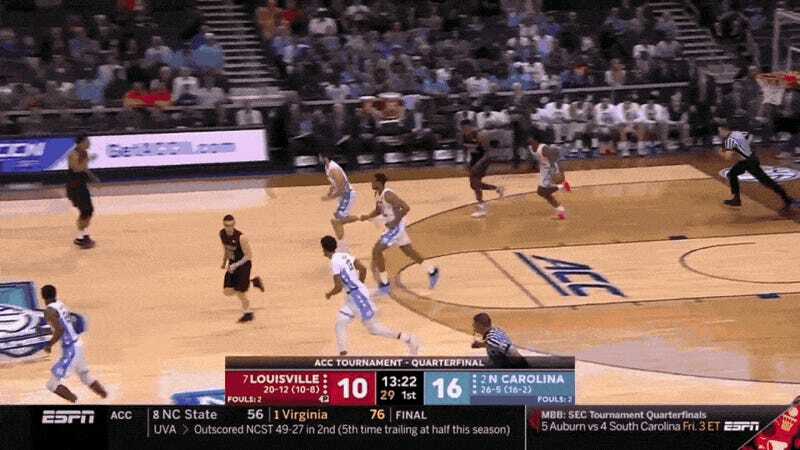 Here is just a diabolical two-pointer that comes as he drives and avoids a Zion Williamson block attempt. He out-highlighted Duke’s highlight machine. The hair makes White the most immediately recognizable player on any court, but his talent makes him unforgettable. Even if you don’t like North Carolina (and I very much do not), White’s brand of basketball is addictive—never ending bursts of energy that can immediately produce astounding plays whenever he touches the ball in the backcourt. And everyone is taking notice of how much fun this is. White’s zooming up NBA draft boards almost as quickly as he can run.